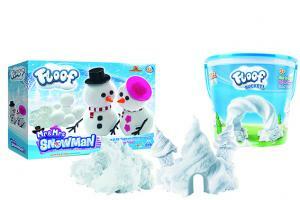 Little ones will enjoy building snowmen all year round with the exciting new Floof play set range, and we have three Floof indoor snow bundles worth £48 each to give away. New Floof is a lighter-than-air mouldable material that is squishy and irresistible, ideal for indoor snow play, and it is reusable so children can enjoy it time and time again (smythstoys.com). Each bundle consists of a large Floof bucket, a Floof Builder Set and a Mr & Mrs Snowman set – which comes with everything needed to make fun mini snowman characters. Enter now for your chance to win! This giveaway is only available to Candis members. Please log in at the top of the screen to enter this giveaway if you are a member. If you are not a member then please click here to find out how to join. This looks so much fun. Snow all year round. Could be fun for my grandchildren and easily stored in bucket!